Mani Chandrasehar was first introduced to Mosaic when his school signed up to the Enterprise Challenge competition during 2013/14. His teacher knew he was interested in business and thought the programme would be exactly the sort of thing to spark his interest. Mani said: “The Enterprise Challenge was a hugely enjoyable experience; we received expert advice about all areas of entrepreneurial activity from some brilliant local experts and my team and I developed what we thought was an excellent idea and won through to the regional final in Birmingham. “However, my journey with Mosaic was not to end there. I was asked to speak at the West Midlands Mid-Year celebration, which was held at KPMG’s offices in Birmingham. Talking in front of a large crowd of people, particularly in such a grand building, was pretty intimidating and as I prepared to go on stage my nerves were in a bit of a state. 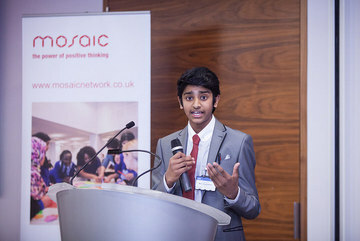 Following his involvement with the Enterprise Challenge, Mani was nominated to join the Mosaic Youth Panel, joining like minded young people from around the UK, all of whom have had first-hand experience of at least one of Mosaic’s programmes. Mani added: “Mosaic have always been keen to listen to our ideas about how the charity is run; the good things as well as the things that could be improved, and I feel that our contributions are always taken seriously. “Mosaic has had a very positive impact on my life. I’m now really keen on public speaking and seek to do so as often as possible. I’ve learnt that confidence comes from being willing to try new things, even if they seem scary at first. I’m also a better businessman, with firm ideas about how things could and should be done in the world outside of school.